Scott and Olivia, soul mates and lovers across time and space, find themselves reunited once again, in yet another attempt to fully love one another. Set in modern-day New York City, EgoManiac explores the archetypes, cliches, and comedy/tragedy of the ego. A Greek chorus of men and women vocally and physically manifest as the lovers’ egos with intent to coerce, entice, cajole, seduce, and imprison them as they seek to fulfill their mutual universal desires to find and keep love. 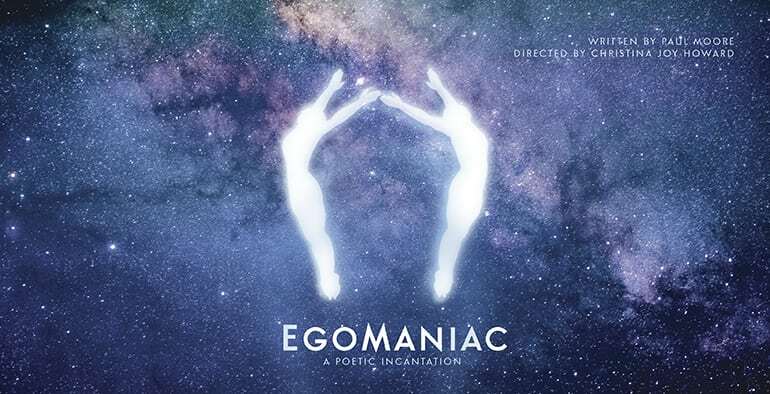 This transformative immersive theatrical experience uses elements of ritual, song, music, movement, and poetry to create a healing, cathartic, and entertaining experience for all seekers. Founded by Paul Moore and Christina Joy Howard, Theater OM is rooted in sacred storytelling and divine love. We are not religious; we embrace the wisdom of all faiths. Both Paul and Christina blend their experiences to incorporate various healing methodologies, including: Viewpoints, Qigong, Reiki, prayer, and meditation into their practice of storytelling and ensemble work. Paul Moore is a writer, actor, Qigong teacher, and founder of Theater OM. He teaches many forms of Qigong including Wild Goose Qigong, Immune Enhancement Qigong, The Creative Organ Cycle Qigong, the Yi Jin Jing. He is developing his own pedagogy in training the physical craft for actors, and plans to produce a full book and curriculum where he will use theories of Chinese medicine and Qigong movements to explore this interface. Paul’s writings include two full length plays (EgoManiac: A Poetic Incantation), and (The Emovere: An Emotional Allegory). He recently adapted EgoManiac into a two episode pilot for television and is currently working on his first novel entitled, (Lost souL). Paul earned his MFA from UCLA’s school of Theater, Film and Television, and is a member of both SAG-AFTRA and Actors’ Equity. Christina Joy Howard is a graduate of the UCLA School of Theater, Film, and Television. She has been a working LA-based actress since 2007, and has been producing independent theater since 2003. In 2007, she launched the critically acclaimed LOFT ensemble in the downtown LA Arts District as the founding Artistic Director, before moving on to focus on independent writing projects and her Reiki healing practice. Acting, writing, directing, and producing have been major facets of her artistic life here in Los Angeles, and she is honored to have found a new calling in launching Theater OM with Paul Moore. Spirituality is the primary focus of her creativity; from this connection she derives her greatest joy and excitement.